The ideal cost solution for Vertical Flat Storage up to 24"x36". 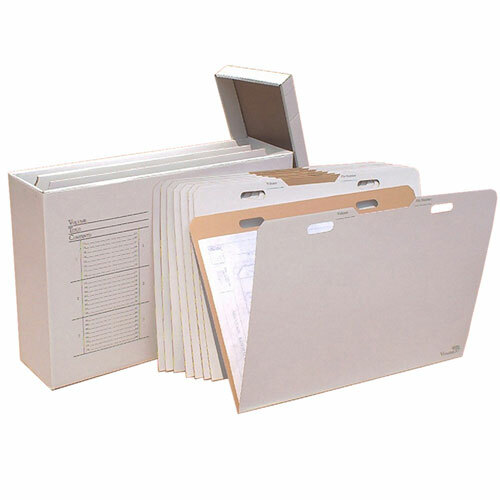 Perfect for 22"x34" and 24"x36" media flat storage with the convenience of a Vertical File. Use for active or permanent storage. Individual vertical folders make retrieving and organizing documents easy. Sturdy, attractive corrugated cardboard with gray lettering. Narrow width saves floor space. Stackable with labeling on top, front and side for easy identification. Interior partitions and rigid "VFolders" provide flat storage. The VFile37 holds 24 VFolder37's with up to 840 sheets. Lifetime warranty on manufacturers defects.